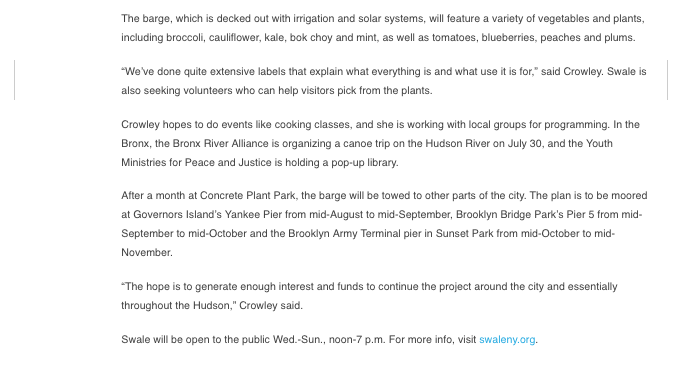 Lucy Biggers of Now This chats to Swale team members about the project while we were docked at Brooklyn Bridge Park! 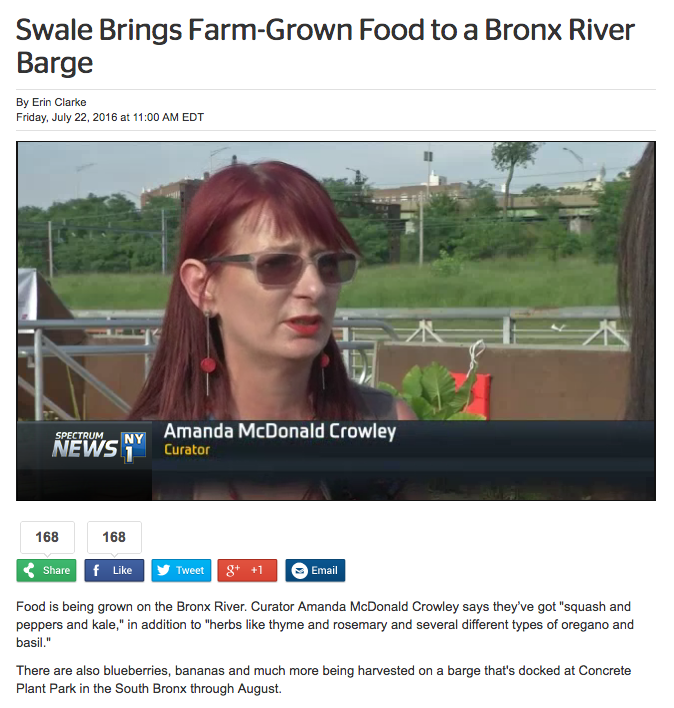 “The 130-foot by 40-foot floating platform is the creation of the non-profit organization Swale, whose founder wants the city to explore growing fruits and vegetables in parks as a way to provide food to residents. “Going forward we can work towards policy change in the city where right now it’s still illegal to grow public food in public spaces and what we hope is that this can set a good example and we can potentially move forward with starting to change some of those old rules,” said Mary Mattingly, the founder of Swale. 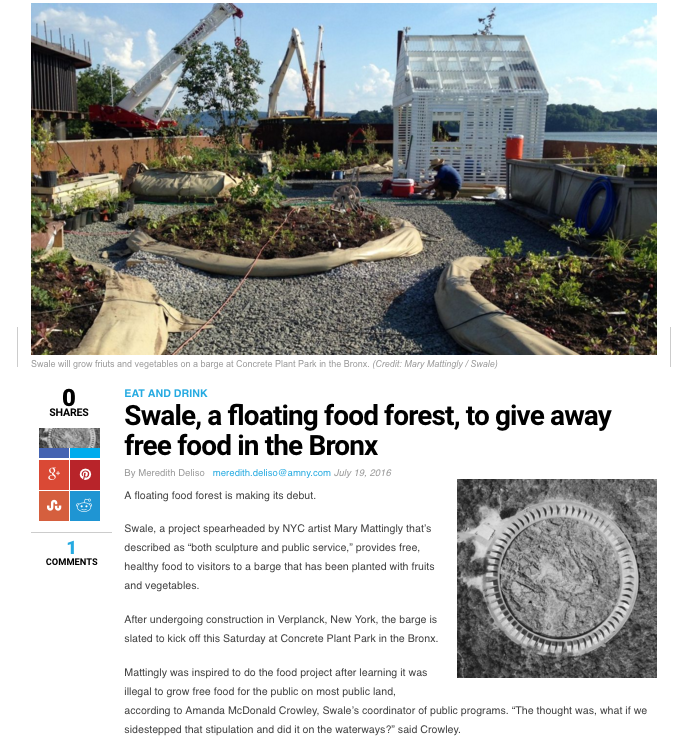 Swale, Mary Mattingly‘s most recent massive undertaking – a public artwork, and floating food forest, is due to open at Concrete Plant Park in the Bronx on Saturday July 23, 2016, where it will dock for a month before moving on to other locations around New York Waterways. I’m working with Mary and her team to curate public programs at our docking locations, and caught up with Meredith Deliso of am New York to talk about the project on Mary’s behalf. 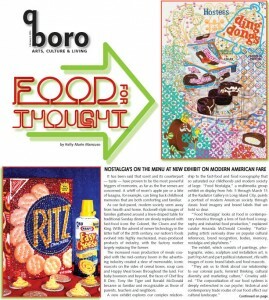 Thoughtful article – Food for Thought – posted by Kelly Marie Mancuso in the Queens Chronicle on Thursday, February 4, 2016 about the food nostalgia exhibition I have organized at Radiator Gallery. Read the full article here. 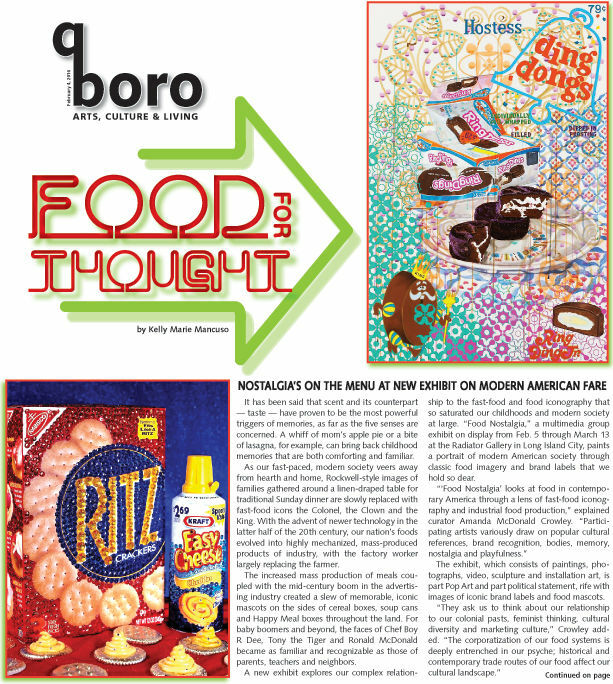 In anticipation of my ArtFoodTech talk at the Parrish Museum on November 6, 2015, Mara Certic interviewed me in The Sag Harbor Express (full interview at the link). Justin Pazera, of KMTV in Omaha speaks to Mary Mattingly and Amanda McDonald Crowley about Flock House Project Omaha. 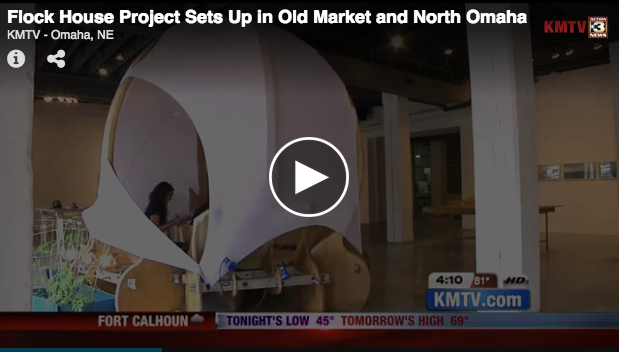 News article is available on the KMTV site. 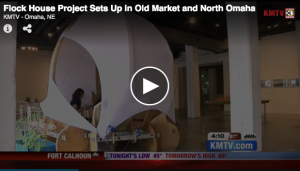 Justin Pazera returned to the Old Market to talk with us as the Flock House Omaha was being installed. Interview with me on the Edinburgh Science Festival’s YouTube channel discussing the GastroLab program I have curated with New Media Scotland, as part of my 2014 Alt-w Design Informatics curatorial residency. 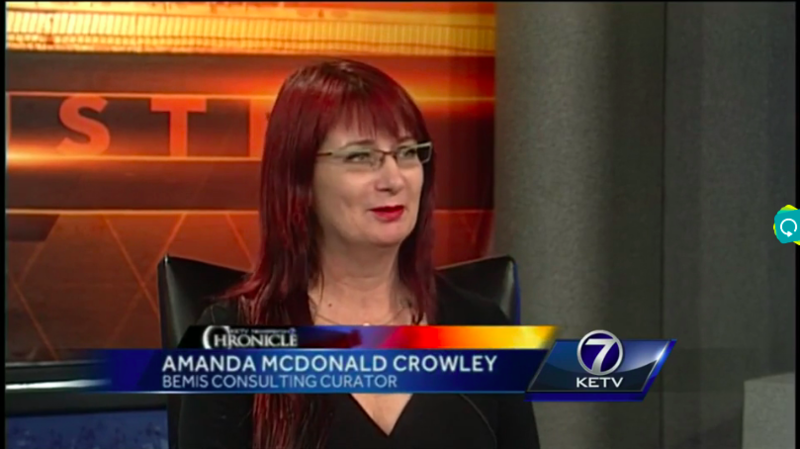 Adam Price and I are interviewed on KETV Chronicle – Omaha Arts Scene, speaking about the Bemis Center for Contemporary Art. Plohman, A. and Sipos, M. 2012 “Out of the Lab: An interview with Amanda McDonald Crowley” Beyond Data, Kitchen Budapest & Baltan Labs joint publication. 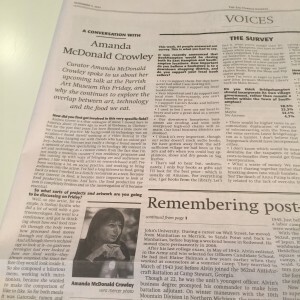 The interview with me is on Page 90. Direto de Nova York, Ronaldo Lemos trata de tecnologia e suas relações com a vida: cultura, economia, política, sociedade e assim por diante. An expose that includes an interview with me, as well as ever brilliant Aaron Myers and Fran Illich.